A friend, iZathere (on twitter) and I took a trip one day in January to Mitsuwa Marketplace. It was a trip to prepare for New York Comic Con. 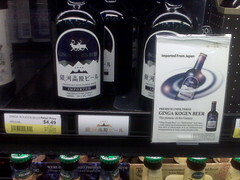 While there I ran in to this bottle that just captured my attention, Ginga Kogen Beer:Silver Bottle. The packaging was just right. Silver Bottle is a fruity wheat beer that was researched expansively by the Ginga Kogen Brewers. They focused extensively on making a good Weizen or Wheat Beer. They show a loyalty to the “German Purity Law” that was declared in Bayern by Wilhelm IV. This law insists on beer being made from only malt, hops, yeast, and water. 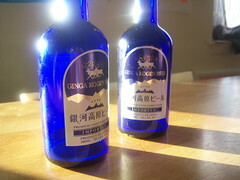 Ginga Kohen considers their beer a “Natural Food” instead of an industrial product. According to Japanese liquor tax law, beer may contain some kinds of auxiliary material such as rice and cornstarch. 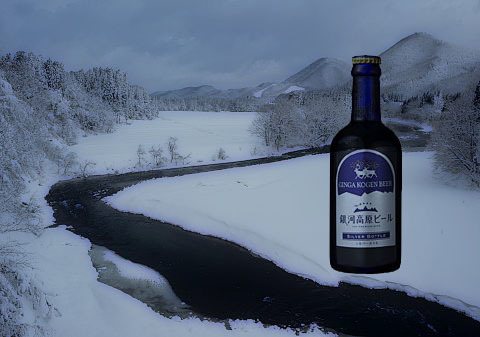 Ginga Kogen beer includes 100% malt and no auxiliary material because they will not provide the sweet taste that malt does. GINGA KOGEN BEER started in 1996, as a project to economically develop Sawauchi village in Iwate prefecture, Japan by Isao Nakamura who established Higashinihonhouse Co. Ltd. Sawauchi village is a heavy snowfall area, so it has rich natural fresh water and it is similar to Bayern in Germany in climate. So, Sawauchi village was appropriate for a brewery. As you can see I took a lot of interest in the beer, but how about the Silver bottle? As for the color and clarity, to me the beer had and unfiltered golden color to it while iZatherez described it as being cloudy yellow with bits floating in it. The smell and hop aroma was that of a Hefe Weizen（wheat beer with yeast added) with a fresh crisp apple smell iZatherez agreed saying he got a wheat smell with an apple aroma also. We also both agreed that this beer had a light body. As for the sweetness of this beer, I thought it was nice, done appropriately. iZatherez thought the Silver Bottle had a light fruity sweetness. When it came to the spiciness of the hops, iZatherez discerned no hops or spice taste. As for me, I thought there was a slight bitterness, very subtle. I thought there was very little lingering bitterness on the beer while iZatherez there is no bitterness or aftertaste, but he does like to drink Jack Daniels and I think that affected his ability to taste things bitter. I thought the flavor of the Ginga-Kogen beer was very crisp with a great apple note, while iZatherez found the beer to have a hint of apple cider mixed with an apple aroma. We both found the beer to be balanced and smooth. We both agreed that the beer was not very complex in its flavoring. As for the alcohol feel of this beer, iZatherez felt it tasted like drinking a light sparkling cider without the fizz while I thought the alcohol feel was very light. We agreed this beer had incredible drinkability. We talked of having this beer over the summer, if possible, and pairing it with fruit or anything containing fruit. A good comic for the beer would be something light and fun, like GON . Gon is a tiny fictional dinosaur and the title character of a Japanese manga series created by Masashi Tanaka. The Gon series features the completely wordless adventures of the irascible title character as he interacts with the natural world. iZatherez wants the original Superfriends comics. We got to thinking and we decided there was anime that was perfect for this “Comic Party,” look it up. Fruity beer with rich taste made by packaging “Weizen”, the traditional beer in the South Germany made of over 50 % of wheat malt, without filtering beer yeast. Blue bottle with modern design brings out table coordinates.